"I don't like the sound of piano music that much." One of the most prominent figures in classical music in the 20th century was Canadian pianist Glenn Gould, who made his name as the preeminent interpreter of Bach, but whose influence extended to appreciation of modern composers such as Schoenberg and Sibelius. Often ridiculed for his habit of singing tunelessly along with his playing (a trait hardly mentioned here, oddly enough), Gould is a person to whom one tends to be either passionately devoted or completely revulsed. He is, however, undeniably an intriguing and complex character, as these 32 short films (actually 31, for the 32nd is the end credits) make clear. Structured after J.S. 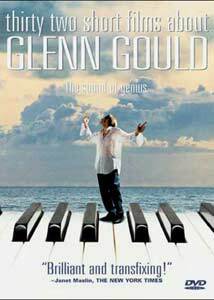 Bach's Goldberg Variations (which consist of a statement of the Aria, which plays under the opening credits, and 30 variations, making the 31 short films referenced above), this is not your average biopic. Like the variations themselves, this is more a kaleidoscopic portrait. We get a brief glimpse of Gould's childhood at first, but then the film travels throughout time and space, here visiting Gould late in his career, then going back to his concert days and his decision to give up performing altogether in favor of recording only. We see his penchant for talking about anything other than music (as Gould interviews himself), and his habit of calling people unannounced and talking for hours, his amazing array of medications he was taking (often with conflicting effects) and his playing the stock market devotedly (and successfully, with the aid of conversations with restaurant waiters and bodyguards of the rich and powerful). Yet at the center of it all is the music and the emotion which it brings out. This is best demonstrated in the Hamburg segment, where Gould gets an LP (of himself playing a Beethoven sonata) delivered to his hotel room and makes the chambermaid (Kate Hennig, in a delightfully unself-conscious little role) listen while he watches its effects upon her. In Passion According to Gould, we see him in the recording studio, transfixed and transfigured by the music, while the recording engineers go about their lives with platitudes and trivialities. The move from concert performance to the purer and more direct realm of contact through recording is represented in the Variation in C Minor, which consists solely of the optical soundtrack to one of the variations of Beethoven's 32 Variations in C minor WoO 80 (of which the title of the film is also evocative). Here we see the purity of the sound visually, as it must have appeared to Gould. Indeed, throughout the film the one message that comes through clearest is that Gould was on a completely different wavelength from most of the people around him. His closest connections seem to be with quite ordinary people (such as the housekeeper of Hamburg, or the stage manager of L.A., The Final Concert, with whom Gould chats happily about that man's upcoming retirement and his new career puttering in his garden. The parallel with Gould's own retirement and new career is unmistakable but beautifully drawn. Yet he is undeniably brilliant and playful on his own terms, such as in Personal, a delectable little piece where Gould writes a personal ad for a telephone pal. Colm Feore turns in a splendid performance throughout as Gould, capturing an amazing array of moods and feelings. The camera work is often intriguing, such as the completely static camera of the 1st and 31st films, where Gould respectively walks a great distance toward and then away from it, surrounded by a snowy waste (which reappears at the midpoint, in film 17, Solitude. The circling shot of the quartet playing Gould's Opus 1 reminds one of the 360-degree kiss of Hitchcock, amended with loving short zooms into the faces of the musicians. Punctuating the film are brief interview excerpts from Gould's friends and acquaintances, most of whom are rather baffled by Gould. Whether or not everything portrayed here is necessarily true, one is left with the impression that what you've seen is incredibly real. This is one of the truly great films of the 1990s and is not to be missed by anyone with an appreciation of music and art. No need to "Blame Canada" about this one. Image Transfer Review: As is typical for Columbia Tristar transfers, this motion picture gets first-rate video quality. Excellent shadow detail and deep blacks are combined with natural-appearing colors (though occasionally the palette is intentionally rather washed out in appearance). Some of the films exhibit grain, but this is appropriate as I recall from seeing the film in the theatre. There are occasional dust speckles, but no significant frame damage is present. Audio Transfer Review: The Dolby Surround track is quite pleasing. There is absolutely no hiss or noise to be heard, which is much to be appreciated in a movie so devoted to sound as this one. The soundstage is heavily front-oriented as far as dialogue is concerned, with the surrounds limited to applause and occasional ambient sounds, and giving added dimension to the music. The music itself comes through clearly and without distortion or clipping of any kind. While a 5.1 presentation might have been superior, this track is excellent in its own right. Extras Review: Regrettably, this important and moving film gets precious little in the way of extras. A trailer for the main picture, as well as two music-related movies, Bossa Nova and The Tango Lesson, are included. Extremely limited biographies and selected filmographies for Feore and director Francois Girard. But beyond that, the 32 Short Films About Glenn Gould are left to speak for themselves, and perhaps that's the best way to leave them. Despite a lamentable lack of extras, this film is incredibly well done and is presented with first-rate audio and video quality, and is thus nonetheless very highly recommended.